Everton claimed a third successive Premier League win thanks to late goals from super subs Dominic Calvert-Lewin and Cenk Tosun. 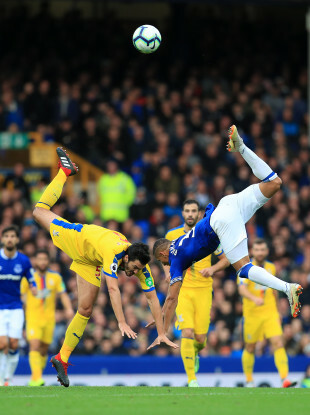 Palace's James Tomkins (left) and Everton's Richarlison tumble after challenging for the ball. Everton striker Cenk Tosun celebrates. Email “Palace miss penalty and lose to late Everton double”. Feedback on “Palace miss penalty and lose to late Everton double”.